Entering the McLaren Technology Centre for the first time is an experience unlike any other - it's designed to be. Stopping at the perimeter security hut you're presented with a site pass that resembles the sort of top secret key card your eight-year-old self might once have drawn on a piece of paper, granting access to the imaginary lair of the make-believe villain. The actual building is accessed via one of several cylindrical white pods which line the edge of the car park, housing spiral staircases and pristine white-walled corridors that stretch beneath the ground. Follow the directions stencilled onto the walls to what seems like a dead end and a hidden lift presents itself, rising through the vast glass-walled atrium and delivering you to a walkway above. It sits neatly positioned at the end of the row, separated from the rest of the collection by a glass wall and facing away towards the paved boulevard which borders the lake. As one of McLaren's PR team escorts me past the glazed workshops and hands me the key, it's hard not to feel just a little like James Bond receiving his latest toy from Q. "Just bring it back in one piece, 007." 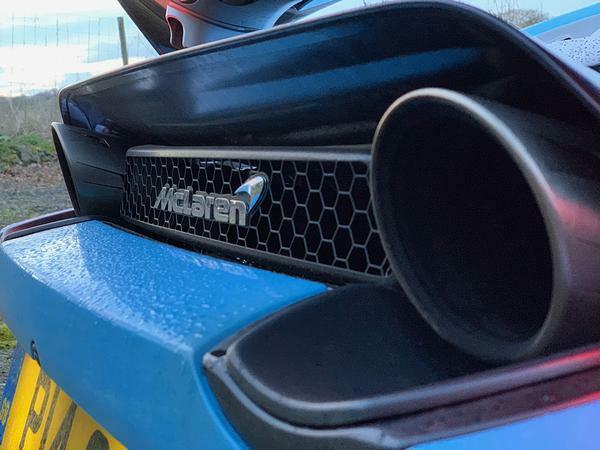 Never has so much time, planning, money and effort gone into making an experience feel quite so cool, in quite such a specific way - which is kind of McLaren's calling card these days. You see, McLaren's sense of drama may not be one of unbridled passion, potency and flair like Ferrari or Lamborghini, but in its own unique way it more than matches its Italian rivals. Ron Dennis' inimitable ethos remains firmly imprinted on the company and the flawless polish he insisted upon never fails to impress. The setup is cutting-edge, race-derived, space-age, high-tech and frankly any other oft-spouted hyperbole you care to think of - only here the terms ring true. Perhaps overly so. The early criticism of McLaren's output was there was perhaps a little too much white walls and not quite enough of white knuckle. That image started to change with the 675, though, and by the time the 570S arrived a better balance seemed to have been struck. 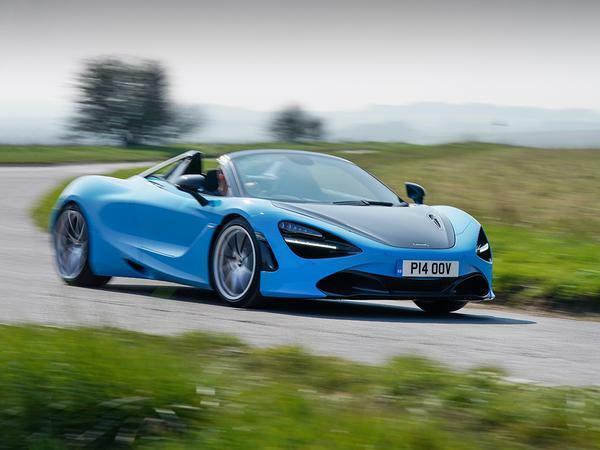 The 720 took on-road performance to new levels when it launched in 2017, its 4.0-litre twin-turbo V8 propelling it seemingly effortlessly from 0-62 in 2.9 seconds and on to a top speed of 212mph. Its form-follows-function design, meanwhile, was highly divisive at launch (bird skull and eye socket mentioned more than once) but with time has been accepted as strikingly attractive. Two years on it remains a benchmark for the segment, so the question is simple: does removing the roof add anything to the experience, and what might have been lost in the process? To find out I'm living with the car for the next week - and by living I don't just mean swanning around with the roof down pretending it's mine. No, there's an airport run to contend with, an excursion to Liverpool and back to watch the football, a journey to my Grandparents in South Wales and all the necessary trips in between. Oh, and an encounter with another fantastic mid-engined machine, the Alpine A110. First though its back home for the night, which means threading the £300,000 supercar through the gauntlet of London's rush-hour motorists, lane-wandering Uber drivers and weaving moped riders. This, unlike in the Aventador SVJ a weeks earlier, proves to be as easily said as done. The 720S Spider's fantastic all-round visibility makes placing it between a bus and a kerb as easy as guiding it through an apex. That's thanks not just to the ultra-thin A-pillars of the Monocage II-S but also the ingenious glazed buttresses and enormous door mirrors that aid rearward glances. The new electrically-operated roof earns its money, too. 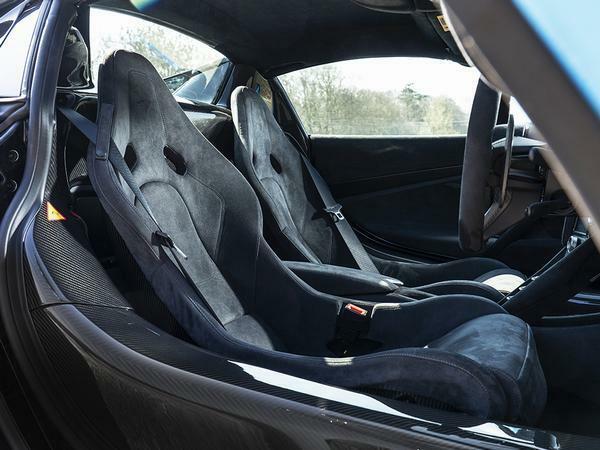 Compared to the 650S it raises or lowers in 11 seconds versus 17 and at 31mph compared to the previous 19mph. Marginal differences perhaps, but when you're on a high street in traffic rolling along at, oh I don't know, 27mph and it starts to rain, it's a pioneering technological leap. The last thing you want is to be the prick in the bright blue supercar, holding everybody up to protect his Alcantara. And when you are, those extra six seconds feel like a lifetime. The next morning sees me repeating the feat in reverse, escaping the city and heading to Heathrow. 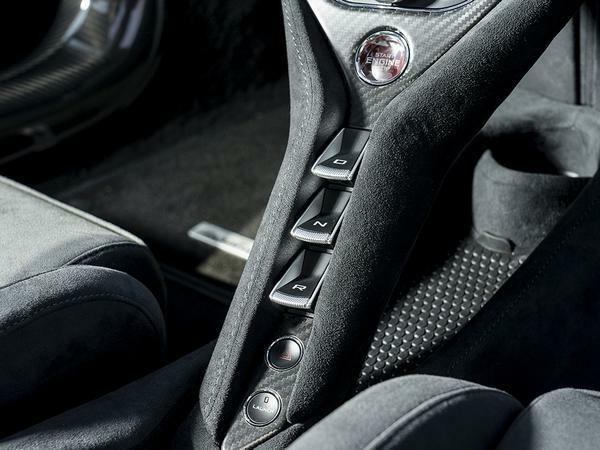 One of the Coupe's defining traits is its practicality, but even in 2019 the ergonomic compromises inherent in making a car that can do what the 720S can can't be entirely avoided. Arriving at the parking barrier the car fits, just, but thanks to the air intakes concealed within the double-layered doors, I find myself a country mile from the ticket machine. Some very un-Bond-like contortion follows, allowing me to just about grasp the paper between the tips of my index and middle fingers, before flopping back through the window like a conger retreating into the seabed. More Johnny English, that one. Over 50 per cent of the Coupe's luggage space is found within the cabin, between the engine bay and the rear glass. The folding roof of the Spider means that this room is lost, however the 'frunk' remains capacious enough for a couple of small suitcases and my traveller has been forewarned that this trip will be carry-on only, meaning that airport duty can be deemed a resounding success. 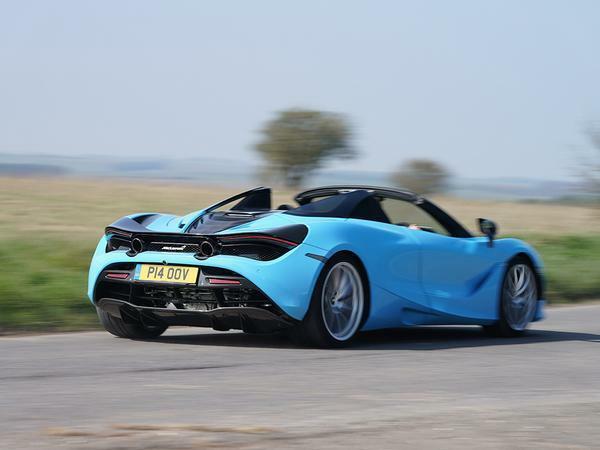 Especially given that the use of the 720 as collection car is a complete surprise, the wide-eyed shock on his face making any previous struggle more than worthwhile. From here we blast down the M4 to the Welsh border where the staging post for the next day's journey to Liverpool is found. This should allow an examination of the 720 in all its glory - or lack thereof - taking the scenic route of A49 with a diversion to some mid-Walian B-roads on the way up, navigating the city once there, and returning via a straightforward run down the M6, M5 and M50. 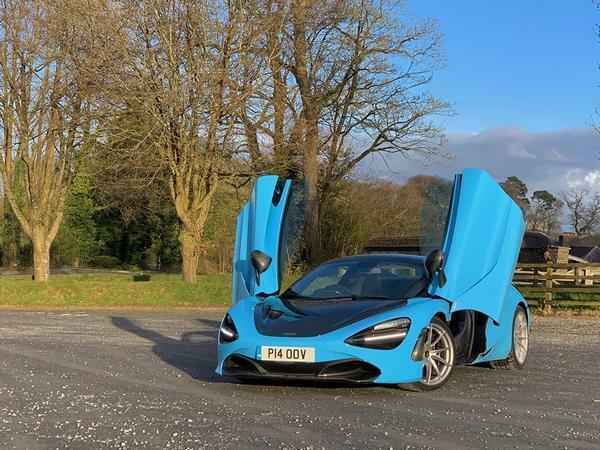 It's the kind of all-encompassing experience that demonstrates exactly what makes a car like the McLaren so damn special. On the wide, open and beautifully empty A road, it flows from corner to corner like honey, dispatching slower moving vehicles with such ease that our arrival time begins to tumble without it ever feeling like we'd been 'pressing on' or making a single risky maneuver. The rear window can be dropped independently of the roof and, so-configured, occupants are treated to a comfortable, almost relaxing driving experience scored by the howl of the V8, the whirl of its turbos and the pops and woofs of the optional-yet-imperative sports exhaust. In this way, even the most mundane of trips become joyous events. And when the time gained allows you to turn off and head for the B4368 at Clun, things get better still. 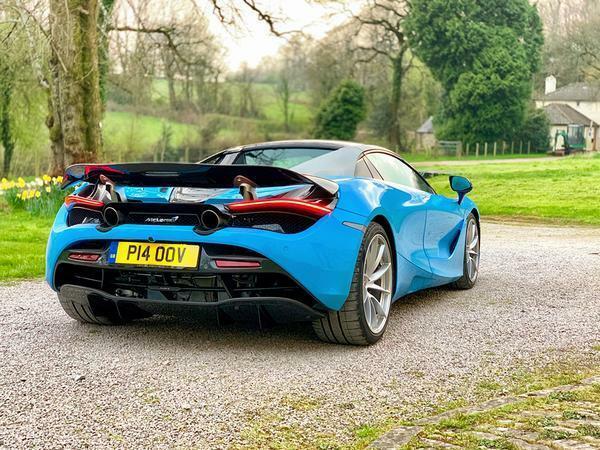 It's the kind of road that modern naysayers will tell you a car like the 720S is too big, too powerful and too ruthlessly competent to enjoy. Nonsense. The honey transforms back into a swarm of angry bees as the 720S surges from corner to corner. Yes, its limit is distant, and the time and place for finding it is not on the public road, but because the percentage you're tapping into is comparatively small - and the McLaren so lovely to interact with even at modest speeds - fun is served up to the driver without any lingering sense of peril whatsoever. For a B-road blast, I'm honestly not sure there's anything better. In Liverpool the same traits that stood the McLaren in good stead in London return to the fore. On the narrow residential roads around Anfield, encroached upon by parked cars on both sides, lined with speed bumps and crowded by matchday fans, there's no guesswork involved in finding a way through. And the front-end lift only has to be called upon once, which is nice. Parking it outside the stadium - thanks to LFC for that one - should be a nerve wracking experience, what with the dozens of fans stopping, staring, filming and photographing the process (I can practically see the viral video before it's happened). 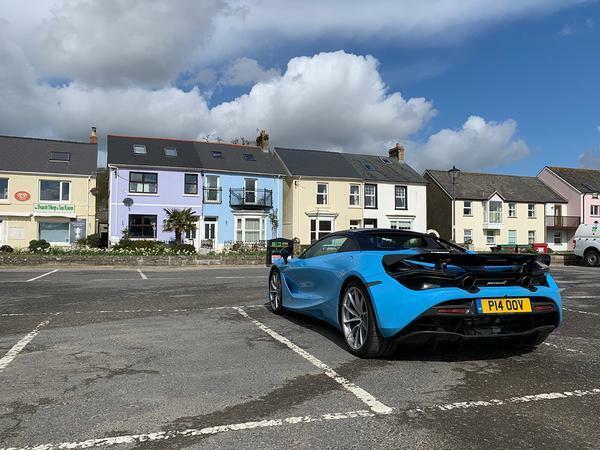 But the 720S tucks itself neatly into the narrow bay, and the dihedral doors open skyward without impeding on the cars beside us. It's a relief, but not necessarily a surprise. I shut the door, step away from the car and ah, the window hasn't slid back up like it should, an issue which has cropped up several times in the past 24 hours. Perfection would be boring though, right? The jubilation of a stoppage time winner is short lived, with the stop-start traffic leaving the match meaning the range which my quarter tank of fuel affords me just 30 miles. 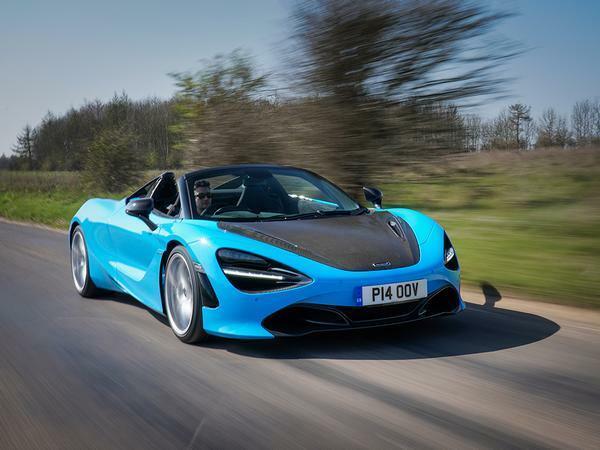 Once we hit the M6, though, the 720S is a perfectly content cruiser, turning over at just under 2,000rpm in seventh gear and returning 300 miles to a tank. Our car is fitted with comfort seats, which are undoubtedly more comfortable than the alternatives, but not unendingly so. The journey passes quickly and uneventfully but even they can't undo the 400 miles we've covered and by the time we leave the motorway I'm ready for the day to be over. But then I drop that rear window, and a cog, and as the cool night air floods the cabin alongside the V8, the 720S's spell proves just as exhilarating as it was eight hours earlier. The car's final pay-off, delivered while stationary on the driveway of a house whose value it far exceeds, is a predictable one but no less important for it. 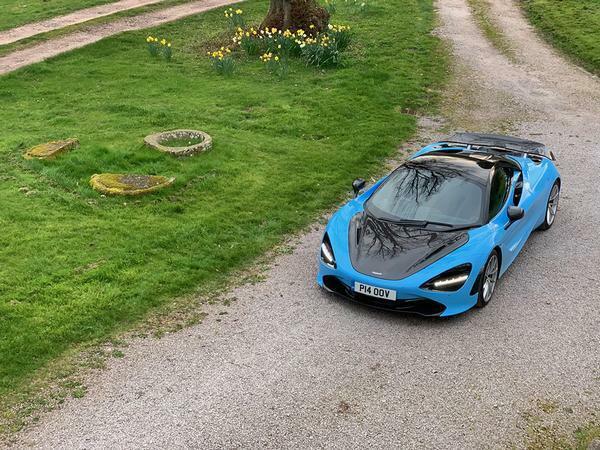 The reaction of my Grandparents' friends, neighbours, postman even, is something of a litmus test for me, and in the case of the McLaren the result is of resounding approval. The same is true whenever the car is taken to areas less accustomed to seeing its like than Kensington or Mayfair might be, with no shortage of interest and admiration shown. Photos are taken, seats are sat in, passenger rides are offered and accepted and with each level of interaction with the car, people's wide-eyed wonderment only increases. 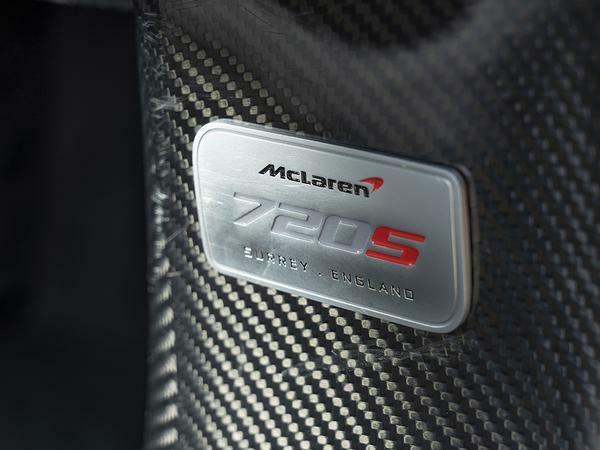 That it's so overtly special to both those with and without a reference point for these things only serves to further underscore McLaren's accomplishment with the 720S Spider. It seems to me that the balance struck here is as close to exemplary as its maker could realistically be expected to get. 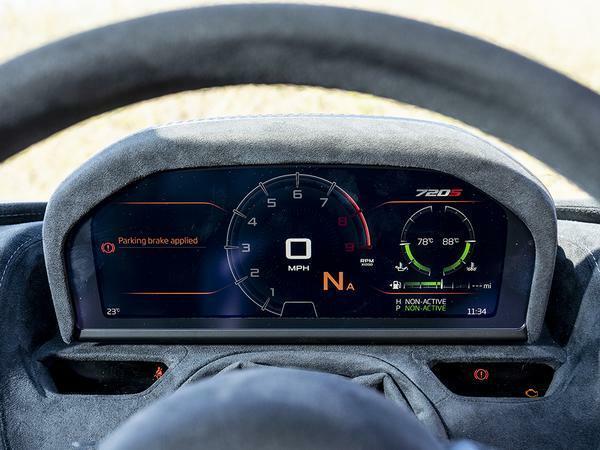 The 720S will play the role of grocery getter if you wish - and without notable strain. It will not unduly strain the driver at 8,500rpm either, but the raw excitement that accompanies open-air exposure to it is unforgettable. Best of all, and much like the carefully manufactured walk from the car park in Woking, it consistently manages to make the journey as significant as the destination, regardless of your original purpose for beginning it. And that, in my book at least, is the trait of a very special thing indeed.